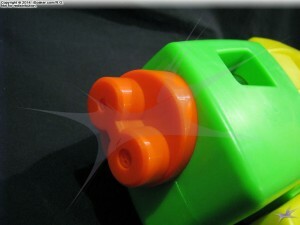 The Water Warriors Steady Blast was previously the largest of the new Water Warriors brand water blaster released by Buzz Bee Toys Inc. in 2015, that is, until the Water Warriors Waterlord was unveiled in April, 2015. 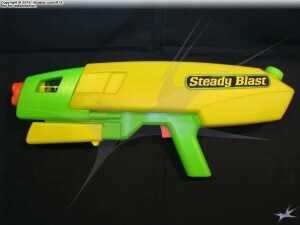 In many ways, the Steady Blast can be considered as the “Big Brother” of the original Water Warriors Steady Stream (2007). The Steady Blast employs the same spring-based water pressure capacitor technology as first seen in the Steady Stream, but has a number of differences beyond styling as well, some useful, others, not so much. Upon first seeing the Steady Blast, the first thing that one notices is how big it is overall. 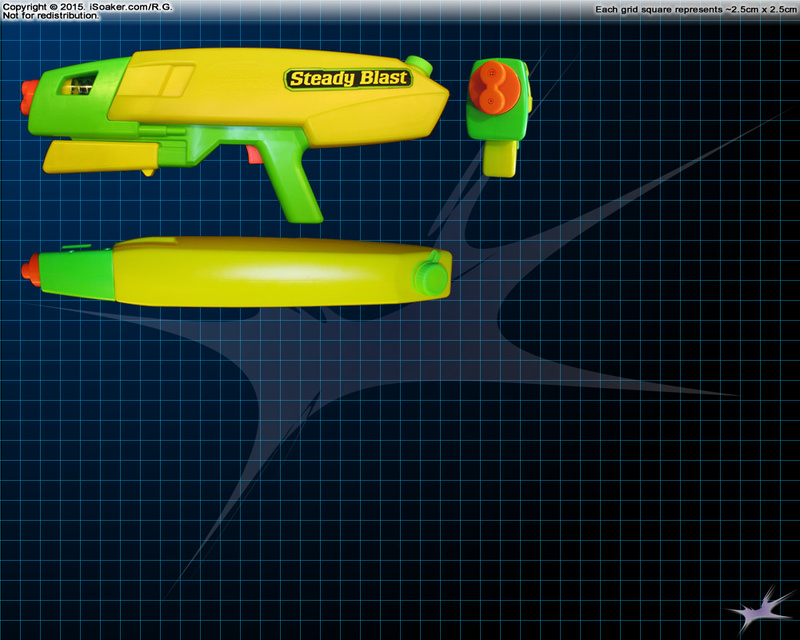 Moreover, like the Water Warriors Waterlord, the Steady Blast’s large, yellow reservoir dominates its profile, clearly showing that this water blaster offers good water capacity. Looking a little longer and one sees that the Steady Blast also has a nozzle selector, though this particular selector has only two settings. The spring powering the water pressure capacitor can be seen through the transparent window molded into the side of the forward casing. There is an orange trigger present on the lower grip area, but it is purely ornamental. Free from its box, not much additionally comes into view beyond the lower fake trigger/grip region. The fact that this area is also completely smooth merely emphasizes the lack of texturing/detailing the Steady Blast. Thankfully, the lower grip’s position is well-placed and the Steady Blast feels well-balanced when empty and when filled. The pump moves smoothly forward and back, though its lack of texturing or indents leaves one less certain where best to put one’s fingers when holding. The smoothness of the pump was something I did not think much of at first. 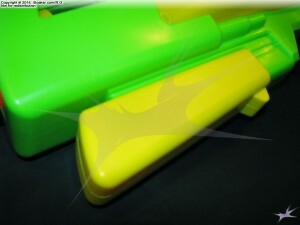 But, as can be see in the picture, apart from the small ridge on the bottom, there are no ridges towards the front of the pump grip, meaning one needs to ensure one has a firm grip on the pump grip and cannot rely more on pushing against part of the pump. Moreover, if one’s hands are wet (which does tend to happen when involved in a water fight), this grip gets a little more slippery to hold and one’s pumping effectiveness is reduced. This is less of a problem for a water blaster where you pressurize, then pull a trigger to fire. However, for the Steady Blast which must be pumped to fire, lowered effectiveness when pumping can become an issue when in use. As noted above, the Steady Blast, unlike the Steady Stream, has a nozzle selector with two options: a stream setting and a burst setting. The stream setting behaves like the original Steady Stream, producing a short stream burst if the Steady Blast is pumped once. 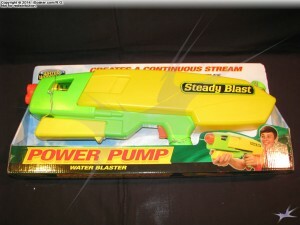 However, if one pumps quickly enough, the spring-based pressure capacitor stores some of the pressure from the pump stroke and keeps the stream firing while the pump is being refilled with water, giving the User the ability to turn this pump-action blaster into a continuous-stream-producing blaster, hence the name, Steady Blast. While the stream setting works as expected, the burst setting, unfortunately, does not. At least from our testing, no matter how quickly the Steady Blast was pumped, it simply never pushed enough water across to permit the higher output burst setting to continually fire. This finding was somewhat disappointing, but upon measuring the total amount of water the Steady Blast can pump in one pump cycle, the volume turned to be only about 75% that of the original Steady Stream! Why the pump volume is less for a significantly larger water blaster is unclear. However, this lower volume combined with a longer intake tube (needed to reach the far side of the reservoir) results in a reduced maximum flow rate from the reservoir to the pressure-capacitor and nozzle. 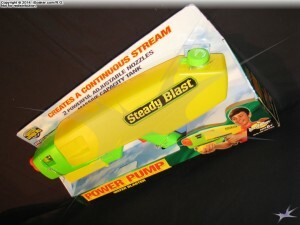 While the pump volume is less, the reservoir volume for the Steady Blast is far greater than that of the Steady Stream. With over twice the capacity of the original, even when pushing out a continuous stream, theoretical total shot time is well over 2 minutes presuming you can continue to pump at the needed rate for that long! However, though the reservoir capacity is better, the reservoir cap is not. Made of a thinner, lighter plastic and not quite gripping the grooves of the reservoir as tightly, the cap feels lower in quality. While it does not need to withstand any significant amount of pressure, sturdy, higher-quality caps feel and seal better. 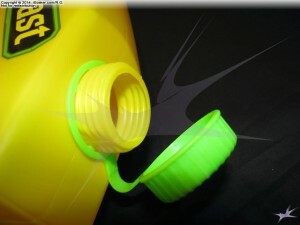 While this cap does not leak, per se, it is also not likely going to withstand use as well in the long run. Moreover, since it merely has a hole drilled into its top to allow air to enter the reservoir as water is pumped out, this cap can dribble slightly if the filled reservoir is left laying on its side. Granted, this cap is better than the original Steady Stream‘s cap, but on a water blaster this large, it feels like a better cap should have been warranted. The Water Warriors Steady Blast is an interesting mix of improvements and not as welcome changes compared to the older Water Warriors Steady Stream. Its increased capacity and nozzle selection are nice improvements, but its decreased pump volume and mediocre cap leaves some definite room for improvement. Moreover, its minimalistic styling does lead to potential performance issues, particularly due to the lack of texturing on the pump grip. Nevertheless, its ease of operation and long field life makes the Water Warriors Steady Blast a good choice for those building up their water warfare arsenal.